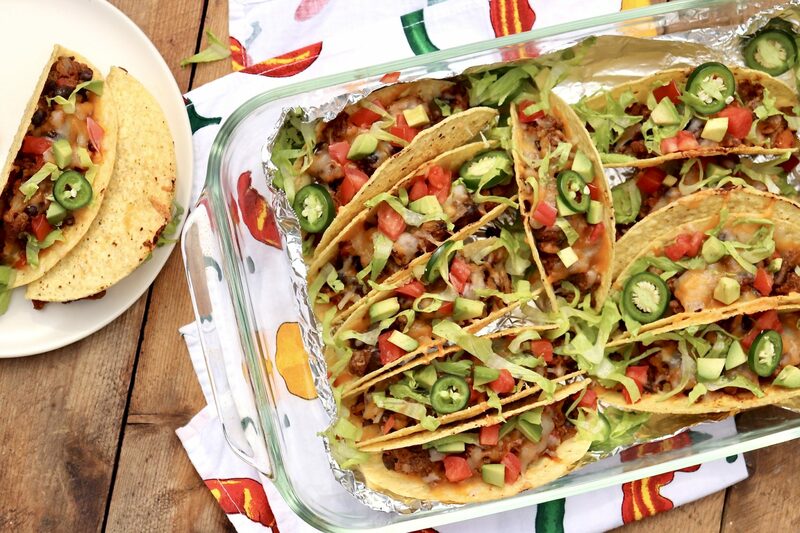 Baked Tacos ~ This novel approach to tacos offers a modern twist on an old favorite that’s perfect for weeknight dinners, casual entertaining, and game day. 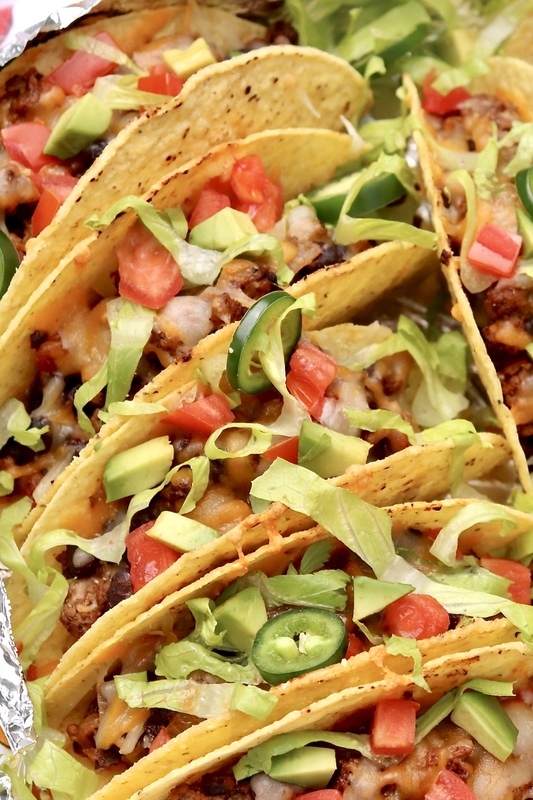 Taco Tuesday is about to get easier, healthier – and quite possibly a little tastier! Taco night was a big deal when I was young. The meal was more of a special treat than a weekly occurrence in our house, and topping the stuffed shells as I pleased always made dinnertime fun. My mom bought thehard taco shells as opposed to the soft tortillas, and I always tried to eat the whole taco without cracking through the bottom of the crisp shell. It never worked, but the messy nature of the dish certainly added to the appeal. These days, tacos are every bit as popular with my family, and over the years I’ve modified both what goes into the filling and how I cook the tacos. The end result is a somewhat healthier meal that I can serve much quicker. With this clever baking method, the shells toast in the oven and soften just a bit under the meat mixture. This means that the shells are less likely to break when bitten and the filling stays put a little better. Another benefit is that all of the prep can be done in advance – no need to scramble to fill the shells as hungry diners eagerly wait! For added value, a can of black beans increases the yield while ratcheting up the nutritional profile. The consensus in my family is that the beans actually enhance the overall texture of the filling. Even my son who typically bypasses beans adores these tacos. To avoid soggy bottoms, the taco shells should be stuffed just before baking, but the actual meat mixture can be prepared well in advance. 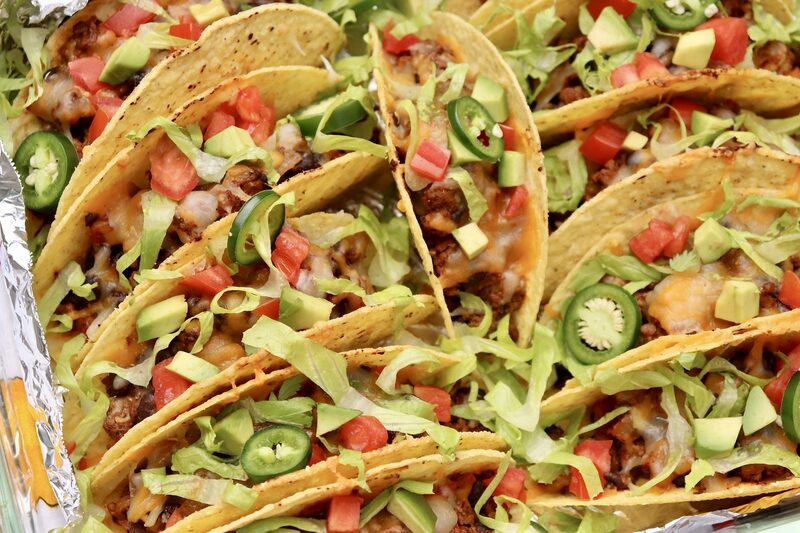 You can also make half the number of tacos called for in the recipe and refrigerate or freeze the leftover filling for an easy meal another night. It freezes quite well. The oven method also makes tacos for a crowd far easier, so feel free to double (or triple) the recipe as needed. In this case, just be sure to use a large skillet to cook the meat mixture. 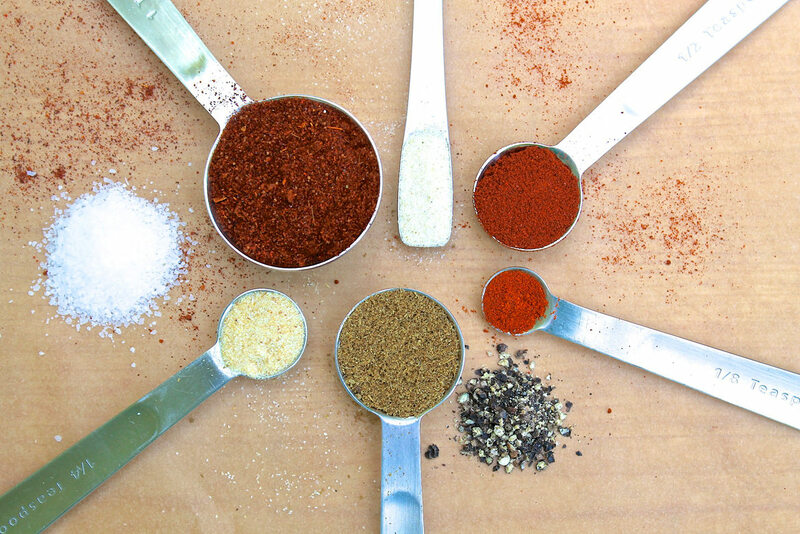 For those who’d like to try, Homemade Taco Seasoning offers an easy way to impart fresher flavor with ingredients you likely have on hand. I like to mix four or five at a time and store in small jars. This novel approach to tacos offers a modern twist on an old favorite that’s perfect for weeknight dinners, casual entertaining, and game day. Optional toppings: diced tomatoes and/or salsa, shredded lettuce, chopped avocado or guacamole, sliced black olives, sour cream, hot sauce, sliced jalapeños, etc. For easy cleanup, line a 9×13-inch baking dish with foil and set aside. In a large skillet, heat the oil over medium heat. Add the onion and sauté until soft and starting to turn golden brown, about 5-6 minutes. Add the beef and cook until it is mostly brown, breaking it up as you go. If you’re not using lean beef, drain the excess fat. Add the beans, salsa or drained tomatoes, and taco seasoning. (Do not add water as called for on the packet directions.) Mix well and continue to cook for 2-3 minutes. Stand the taco shells up in the prepared baking dish. Divide the beef mixture evenly among the shells, packing down lightly. Top each taco with about 2 tablespoons of shredded cheese – you can eyeball this, going heavier or lighter as preferred or omitting for any dairy-free eaters. Bake for 7-10 minutes or until the cheese is melted and the shells are toasted. Serve with toppings of choice. *For added ease if using Rotel tomatoes – or if your salsa is very liquidy – pour over the beans in the strainer after rinsing and draining the beans. (Don’t further rinse the tomatoes.) Also, note that Rotel original has a spice level similar to a mild salsa, but some varieties are spicier. Make sure to look at the label so you aren’t surprised by unexpected heat!